Ganoderma is referred to as the "King of Herbs". Since ancient times Ganoderma is being used to maintain good health and also to overcome many types of health issues. Ganoderma is a type of mushroom, which is very high in medicinal properties. 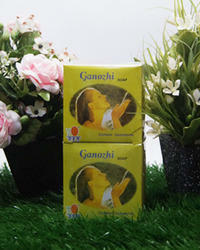 Ganozhi Soap is specially formulated and enriched with Ganoderma extract in palm oil. It is rich in Vitamin E and anti-oxidants. It gently cleanses the skin while preserving its natural oils without damaging the skin structure. It gives your skin a soft and silky feeling and keeps it always young. Ganozhi Soap is specially formulated and enriched with Ganoderma extract in palm oil. It is rich in Vitamin E and anti-oxidants. It gently cleanses the skin while preserving its natural oil without damaging the skin structure. It gives your skin a soft and silky feeling and keeps it always young.